Around this time three years ago, the Captain was writing about the drought in California, and he was comparing the situation from California to Montana. The water drought news last week in California and the mandatory restrictions that their Governor is putting in place got me thinking about Montana’s overall water situation and how it might affect fishing this spring and summer. As you know we have had a strange winter in Montana. The snowpack for the most part is below normal but the average precipitation to date in some areas of Montana is actual above normal. What does this mean for our rivers streamflow and our reservoirs water elevation? It is too early to tell what kind of affect the lack of snow pack will have because we still have what is historically three of the wettest months of the year ahead of us when it comes to precipitation. So if we receive normal precipitation for April, May, and June then for the short term the water elevations should be okay on the reservoirs. The Captain continued to talk about Fort Peck water levels and how the USACE decides how much water to let out of the reservoir. To read the Captain’s full Captain’s Column from early-to-mid April of 2015, click here. 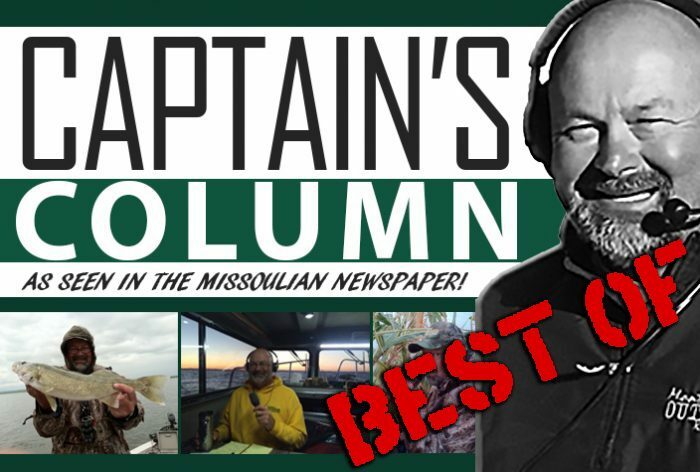 There you have this week’s BEST OF Captain’s Columns right here! Tune in next week to see how far back we go!